My public speaking career began in high school. As the final for a drama class I drew a slip of paper out of a hat and spent five minutes talking about. 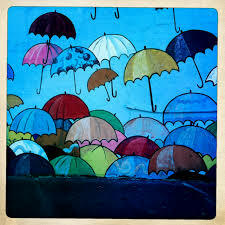 . . umbrellas. After extolling their usefulness, detailing the stylistic options, and exhorting everyone to carry one at all times, I decided public speaking wasn’t so hard. Now that I’m well out of high school, I realize that telling a compelling story in public is, indeed, hard. During this month we explored ideas, resources, and tools to help leaders articulate a vision for the future. This important leadership role is not easy. Like anything else, it takes practice. The Eloquent Woman – blog provides ideas and inspiration for public speaking, with video clips and analysis that could be useful for all leaders. TED Talks – another great resource for compelling vision stories. Searchable by topic, it includes hundreds of inspirational talks by famous and every-day people who have something important to say. Which leadership speeches have been inspirational to you? What did the leaders do to present a compelling vision? This entry was posted in change and transition, communication, Leadership and tagged Change, communication, Leadership. Bookmark the permalink.